Boo! This year LUSH Ltd have come up with something a little different for Christmas Halloween (it’a all blending into one at the moment) rather than purely a range of bath ballistics bath bombs. 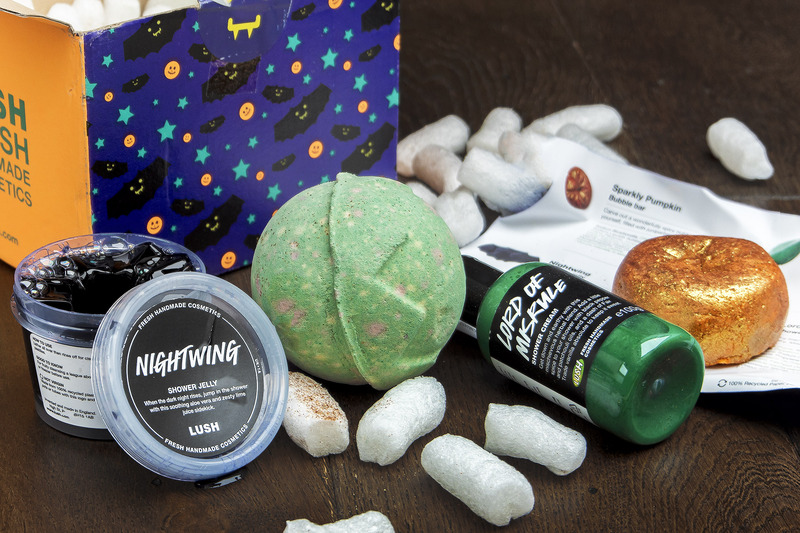 No, this time there’s 4 core products including the Nightwing Shower Jelly; Lord of Misrule Shower Scream; Lord of Misrule Bath Bomb (a returning favourite); Sparkly (*sigh*) Pumpkin Bubble Bar. Halloween is the only acceptable time to bring out the shower jellies IMHO. They’re gross with a very odd, slime-like consistency. Whilst this isn’t what I want at Christmas or Easter, this is definitely what I want to get into the freaky-spirit on Halloween. Fragranced with distilled lime, aloe gel, fresh lime juice and carob syrup, the scent is to diiiieeee for (said in the voice Vincent Price). Pull a bit off and whilst trying to avoid it inevitably falling to the shower floor and down your plug-hole, crush it in your hand and work it into a beautiful, fragranced lather. Oh, and it’s shaped like a bat. So gorgeous. this is definitely my favourite bath bomb, with the same scent as the shower cream – vanilla absolute, black pepper and patchouli. It drops into the water foaming and bubbling green, then all of a sudden a deep, wine-coloured mist begins to bleed out turning the water a fabulous shade of red. It’s absolutely gorgeous and so relaxing! This article first appeared on MANFACE written by Thom Watson. It was published on Friday 23rd October 2015 and was last updated on Monday 3rd April 2017 at 1:19pm. It's categorised under Bath, Cleanse, LUSH Ltd where you'll find more related content. Lord of Misrule is one of my favorites from their Holiday collections!